This dish is a delicious evening meal served with a black pepper and mushroom sauce and parmesan baby potatoes. 2. Place the baby potatoes and garlic cloves in a large saucepan with a pinch of salt, then cover with water. Bring to the boil, then reduce to a simmer for 15 minutes, until the potatoes are almost cooked through and easy to crush. Drain and transfer the potatoes and garlic to a baking tray. Scatter over the parmesan and drizzle with 2 tablespoons of the oil, then roast in the oven for 15 minutes, until golden. Keep warm, uncovered. 4. Add the shallots, thyme and crushed black pepper to the same pan, still set over a medium heat and without removing the leftover fat, and cook for 30 seconds, until softened. Add the mushrooms and sauté over a medium-high heat for 2 to 4 minutes, until coloured. Sprinkle the cornflour over the mushrooms and cook for 1 minute more. Slowly stir in the white wine and let it bubble up for 1 minute, then stir in the chicken stock. Simmer for 1 minute and check the seasoning. Remove from the heat and swirl through the crème fraîche and parsley. 5. 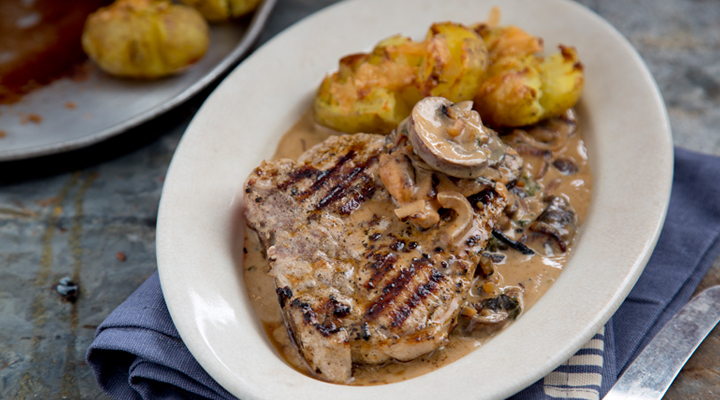 Serve the T-bone pork chops with the parmesan potatoes and spoon over the black pepper and mushroom sauce.